The Philharmonic Gold Coin is one of the world’s most sough-after gold bullion products. Released yearly by the renowned Münze Österreich AG (Austrian Mint) it is among the very purest gold products in the world. Sometimes referred to simply as the Philharmonic, it was first produced in 1989 and soon became Europe’s biggest selling gold bullion coin. The Vienna Philharmonic mints five different standard weights of gold bullion coins, with the 1oz and 1/4oz versions produced during the coin’s first run in 1989. Come 1991, the 10oz was added, followed by the 1/2oz in 1994 and 1/25oz in 2014 (for the coin’s 25th anniversary). A few special editions have also been minted over the years, most notably the “Big Phil”, released to celebrate the Philharmonic’s 15th anniversary in 2004. Weighing a massive 1,000 ounces, it had a nominal value of €100,000. The 1/4 oz Philharmonic, one of the original releases, has a diameter of 22mm and a thickness of 1.2mm. 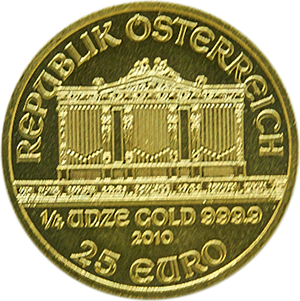 One of the very purest gold bullion coins in the world, 24 carats, it is worth far more than its stated face value of €25 (500 Austrian Schillings before the introduction of the Euro in 2002). The Philharmonic Gold Coin’s design is based on the world-renowned Vienna Philharmonic Orchestra, which is represented on both sides of the coin with the building on one side and various instruments on the other. Production for the coin reached a peak in the mid-1990’s, after which production fell significantly. This trend was reversed in the wake of the financial crisis of 2008, with nearly 1m 1oz Philharmonics minted the next year. More than half a million of the coins are still produced to this day and it still makes up more than 35% of all gold bullion sales in Europe.